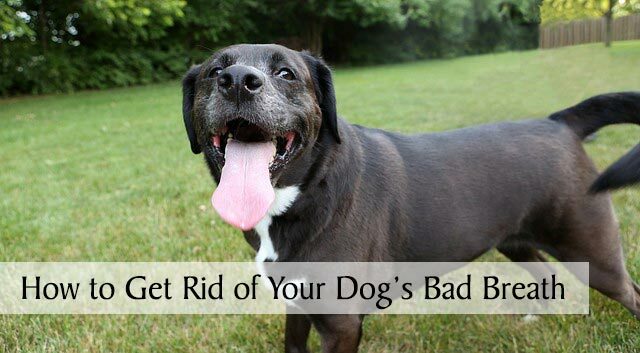 Yesterday I posted What Causes Your Dog’s Bad Breath? Now, you’re probably wondering what you can do about it, right? I won’t keep you in suspense any longer, here’s what you need to know about how to get rid of your dog’s bad breath. 1. Determine the cause of bad breath. 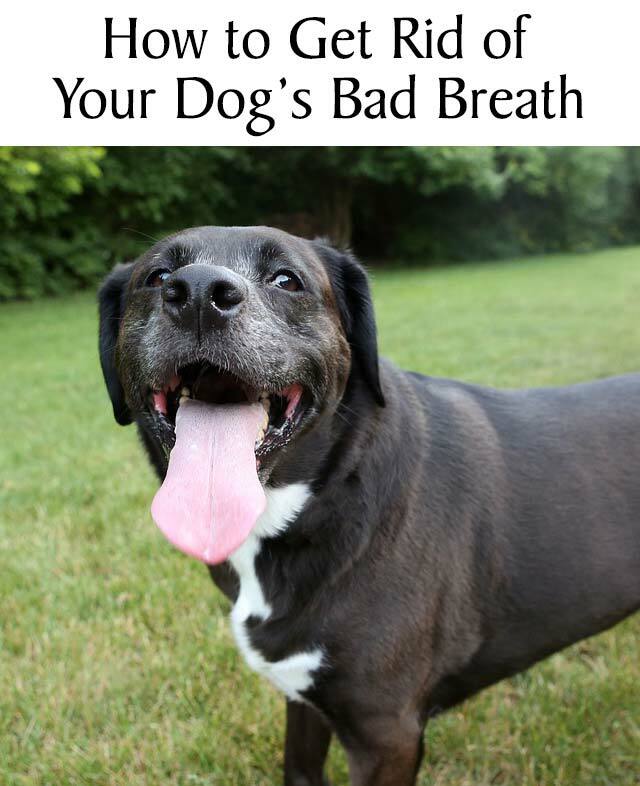 If your dog has persistent bad breath, you should first see your vet to determine the cause. Your vet can tell you if your dog’s halitosis is due to poor dental health or another condition and they can advise you if a professional cleaning is required. Watch the video below by the American Veterinary Medical Association to learn more about protecting your dog from periodontal disease and be sure your vet inspects your dog’s teeth and gums each time you go in for a visit. 2. Brush your dog’s teeth. Dental or gum disease is the most common disease in adult dogs and there’s a strong link between gum disease and heart disease. Daily teeth brushing can not only prevent gum disease but it can improve the overall health and possibly extend the life of your dog. To make the job easier, there are finger toothbrushes, doggie toothbrushes and even electric toothbrushes but you can also use plain gauze or dental wipes if they work better for your dog. Be sure to only use toothpaste made for dogs; try some yummy flavors like chicken or beef to make brushing more appealing. Daily brushing also gives you the opportunity to inspect your dog’s mouth for sores or abnormalities and to make sure their gums are a healthy pink color. If you’re new to the idea of brushing your dog’s teeth, the video below by the American Veterinary Medical Association has some great tips to help you get started. 3. Give your dog appropriate chew toys. 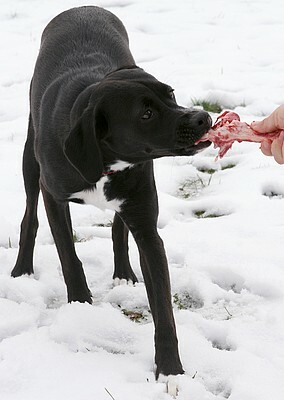 The chewing action on hard but safe toys and bones will help scrap and clean the surface of your dog’s teeth. Some types of bones are controversial because they can cause cracked teeth. As a matter of fact, Haley cracked one of her molars while chewing on a hard Nylabone a few years ago. Check with your vet to see what they recommend. Mine suggests antlers or raw bones but hard rubber toys designed with surfaces that clean teeth are normally a safe bet too. 4. Consider using oral rinses, gels, sprays or water additives. There are many products on the market that can help improve your dog’s oral hygiene particularly if you’re unable to brush their teeth every day. Most contain ingredients like chlorhexidine gluconate or zinc which help prevent the formation of plaque and tartar. Not all products are effective though, so consult with your vet or check out this list of recommended products from the Veterinary Oral Health Council. 5. Evaluate your dog’s diet. If your dog’s breath or dental issues are related to diet, talk to your vet about an appropriate and healthy alternative diet. Some raw-feeding dog owners swear by the benefits of a raw food diet and raw bones to help clean the teeth, but making the switch to a raw diet requires a certain level of commitment and a lot of research beforehand to make sure your pup receives a balanced, nutritious diet. 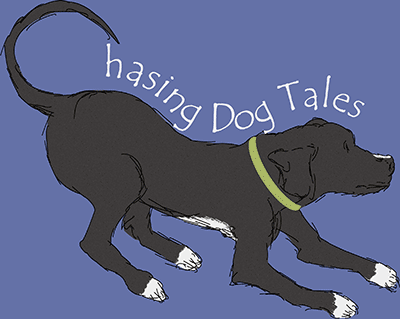 If you’re interested in learning more about raw feeding, jump over to Kimberly’s Keep The Tail Wagging blog for lots of helpful information. There are also dental-formulated foods that can help control the formation of tartar. If your dog’s bad breath is related to gastrointestinal issues, talk to your vet about the benefits of adding plain yogurt to their meals. 6. Give your dog dental chews. 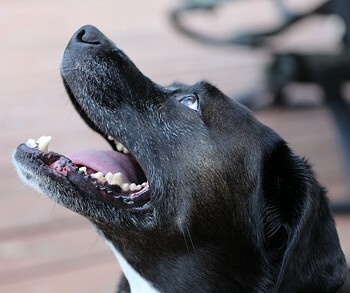 Dental chews can be an effective way to help keep your dog’s mouth and teeth clean. Most are slightly abrasive and contain ingredients such as chlorhexidine gluconate or sodium hexametaphosphate to help fight the buildup of tartar. Just remember that these are called dental chews, meaning in order for them to be effective they need to be chewed. If your dog tends to swallow these in big pieces, they’re probably not going to be very effective. 7. Try natural remedies for occasional bad breath. Some natural remedies include adding some fresh, chopped parsley to your dog’s meal, feeding carrots (or hard treats) to help clean the teeth as they are chewed, adding organic, virgin coconut oil to your dog’s meal and adding a little lemon juice to their water. I’ve only tried the carrots and coconut oil, but I always recommend people check with their vet first before trying any natural remedies. I’ve also seen breath mints that are marketed for dogs, just make sure you don’t give your dog any mints made for humans that contain Xylitol which is very dangerous for dogs. It’s important to keep in mind that although breath fresheners can cover up your dog’s stinky breath, they don’t treat the underlying cause. 8. Wash your dog’s food and water bowls regularly. I’ve saved the easiest one for last! Food and water bowls can harbor bacteria and fungus when they’re not cleaned on a regular basis. That slimy residue on the side of your dog’s water bowl contains some pretty yucky stuff that will end up in your dog’s mouth. Also, consider ditching any plastic or ceramic bowls for less porous stainless steel or porcelain varieties which have fewer crevices for bacteria and fungus to grow. There you have it! Start off with a visit to your vet to determine the cause of your dog’s bad breath and follow up with a commitment to practice good oral hygiene. I admit, I could do a better job of taking care of Haley’s teeth. I don’t brush her teeth as often as I should but I use a gel product that helps prevent the formation of tartar. She’s had a couple of professional cleanings while she was anesthetized for other surgeries and her vet is pretty happy with the condition of her teeth and gums. With 80% of dogs over the age of three already having gum disease, it’s pretty clear most of us need to do a better job with our dog’s oral health. Daily brushing is the best way to achieve that goal and improve the overall health of our dogs. And there’s another bonus, we would likely avoid the risk of anesthesia and the cost of those professional cleanings! Do you brush your dog’s teeth? Share your brushing tips and suggestions for how you get rid of your dog’s bad breath. These are some really great suggestions! I’ve never heard of using oral rinses, gels or water additives to prevent plaque and tartar. I will definitely look into these as I’d really like to decrease the build up around a few of Cody’s teeth. Thank you for such a great collection of tips! I’m so glad you found the tips useful. I’m going to check into a gel product that was on the VOHC list (DentiQ) since it might be better than what I’m using now. These are all excellent tips. We are not good about brushing or giving chews. Our dogs are aggressive chewers so giving items to chew is a challenge. We do a lot of the other things though, including washing bowls. I’m thinking about buying another set of bowls so one set can go into the dishwasher every day. That would be more convenient than washing them by hand. Thanks, we all love those brilliant, bright smiles! ? Hi Elaine. You have some good tips in this post. I really liked the AVMA video about periodontal disease. I do want to mention that bad breath is not the only sign of dental disease in pets. When I am performing physical examinations on dogs with their parents present at the veterinary hospitals where I work, I show pet parents how to gently pull their dog’s lips back to examine their dog’s premolars and molars way in the back of the mouth. Oftentimes the worst accumulation of tartar and the most severe dental disease is on the premolars and molars in the back of the mouth where many pet parents never think to look. Thanks for that fantastic tip to check those back molars. I remember my vet mentioning that it’s usually the canines, premolars and molars where they first see tartar buildup and the start of gum disease. He said if I could just brush those spots on the outer, top teeth, it would go a long way in preventing problems. His point was that a lot of dog owners give up on brushing because it’s so hard to get every tooth (especially the inner surfaces), but even if you just focused on those few problem areas it would really benefit the dog’s oral health. On a side note: While I was writing these posts, I think I might have figured out why my vet recommended antlers for chewing but not hard Nylabones (which are softer than antlers.) It occurred to me how the chewed ends of the Nylabone get little depressions from their teeth. I wonder if Haley’s tooth got caught in one of those depressions and when she chomped down hard there was no give which caused her tooth to crack. The antlers are harder but slick, so there’s usually nothing for a tooth to get snagged on. Maybe I’m the last one to figure this out, but I was always confused by that recommendation because I thought the harder the bone, the higher the risk of cracked teeth. So many people forget to wash their dogs ‘ bowls, thanks for posting the reminder! Yes, I’m going to be better about washing them more often too. Thank you for joining the blog hop! I admit, I am not the best at brushing their teeth. But they do get fed raw, so they are doing some bone chewing. Their bowls get washed with a non-toxic dish detergent after every meal and I do my best to wash their water bowl every day. These are all great tips and a really good reminder that I need to start working on brushing their teeth. Our miniature poodle has had bad breath since he was a puppy. He is a puppy mill rescue. He had giradillia (spelling) when we got him which took 3 rounds to treat. His teeth are great for 12 yrs. but his breath is getting worse. He has had pancreatitis 2 times Once when he was 2 then when he was about 7. He hates parsley. Loves most fresh veggies allowed …eats grain free dog food and uses a mouth wash from the vet. He is healthy and spry for a 12 yr. old. The vet says some dogs just have bad breath. Any suggestions out there?